Published in City Limits, November 6, 2012. Last-minute changes in polling sites left many voters in the Bronx confused about where to vote and in some cases, even prevented them from voting. Wilfredo Reyes, a custodian at the P.S. 69 Journey Prep School in the Bronx, spent Tuesday morning directing baffled voters who came to school, which was originally set to be a polling site. 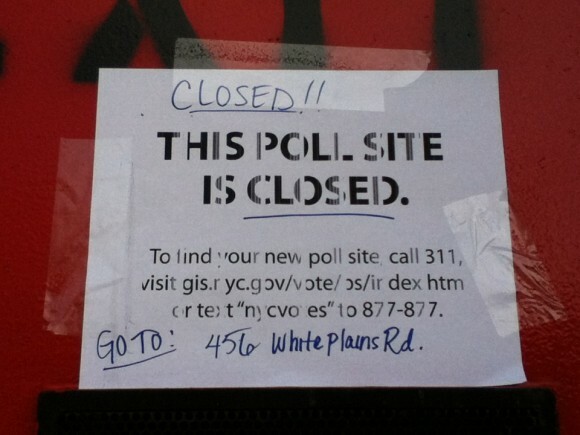 The school was one of three polling stations in the Bronx that had to be shut down and moved to other locations due to damages from Hurricane Sandy last week. As of Tuesday morning, 60 polling sites had been changed. Reyes was concerned about senior voters who came to P.S. 69 and said he wished there were buses that could take them over to the new polling location at Archimedes Academy for Math, Science and Technology Applications on White Plains Road. After finding the site was closed, several of the older voters went back home, he said. “A lot of elderly people came here and they can barely walk. They’re going to lose the vote that way,” Reyes said. Information about the new polling sites didn’t make it out to many voters like Hector Bermudez. Bermudez, 60, first showed up at the original polling site at P.S. 69 only to find the school doors shut with flyers indicating the location was closed. Bermudez, who was using a walker due to a recent knee replacement, walked over to the new polling station several streets away. “It’s only 4, 5 blocks but for old people, the handicapped, they can’t walk,” Bermudez said. Eric Toro had been voting at P.S. 69 for the last eight years, but also didn’t know that the site had been relocated. “I was very surprised. It was little quiet here. I didn’t see any lines,” said Toro, who was holding his voter information that noted P.S. 69 as his polling station. “Hurricane Sandy has created tremendous chaos and confusion,” he said. Emmanuel Sapp, 85, also waited at P.S. 69 for many of his friends who were planning to vote there. Many of them were left in the dark, he said. “Everyone was going there, but they didn’t know where to go. Lucky enough that I’m 85 and still able to get around,” Sapp said. Ludella Pinkney, 86, had a friend from church drive her over to the new location after discovering the change. “It was very confusing,” she said. Walter Barnes, polling coordinator at the Archimedes Academy, the new location, said that this year’s election was unlike any other. “This one is very unusual and very hectic,” Barnes said. This entry was posted on Friday, November 9th, 2012 at 3:14 am. It is filed under Print. You can follow any responses to this entry through the RSS 2.0 feed.